Though I used to bake many cakes and cookies (yeah baking is my hobby and for those who visited my blog often know well about this) , I still prefer typical Asian food, especially our own Burmese food. Thus, western food has a very rare chance to appear on our dining table. We love to eat all sort of Asian food such as authentic Thai food, Indian food, Chinese food, Vietnamese noodle (Pho) and etc. 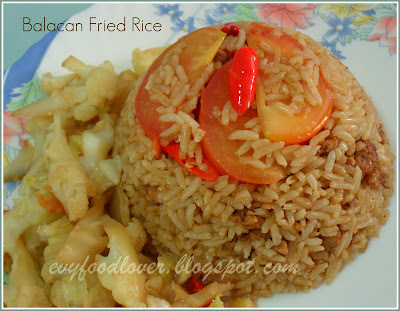 Mix rice with soy sauce/oyster sauce and seasoning powder, set aside. Marinate the chicken with salt/ seasoning powder and a little bit of chili powder. In a frying, heat up the oil and fry garlic till fragrant. Add in marinated chicken and fry for about 2 mins. Add in balacan/ chili powder / chili padi / tomatoes and fry for another 1 mins. Finally stir in the rice and fry for about another 2mins. Dish out and ready to serve, enjoy! Evy, it looks great. I am thinking what is belacan paste? oh..it is shrimp paste. I usually cook something different such as fried rice, noddle , etc(not rice and dishes) every friday dinner and start to run out of ideas as I do not want to repeat previous ones often. now I can add a new dish to dinner list. I will prepare this for tomorrow dinner. Thanks for sharing. Hi Lee, thanks for visiting. Yes, it is shrimp paste. 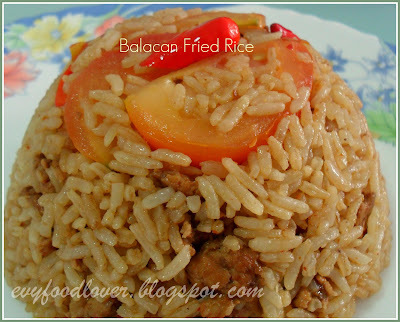 I am so used to use the name "balacan" and forgot to explain what is this. :D. All the flavors can be adjusted to your taste, like adding a little fish sauce or reduce chili if you cant take too spicy thing. Hope you like it.